If it is just happening to me, no problem; but it occurs to me that if it happens to others, especially potential new members, they may think the site has gone away and they might not try to come back, which is not a good thing. For a few weeks, I've been getting an error every time I access the forum (and I daily clean my cookies & browsing history; it does it whether I type in the URL or click my shortcut). The screen below pops up, and usually within a few seconds it moves along to the forum, but sometimes it doesn't (or maybe I just don't wait long enough), but hitting 'reload' works. This did not start immediately after the software change, but a few weeks after. I have Win10, and use Chrome; I dislike Edge so rarely use it -- just tried it and the DNS screen doesn't come up (but have only tested it once, so...). My internet provider is Charter. 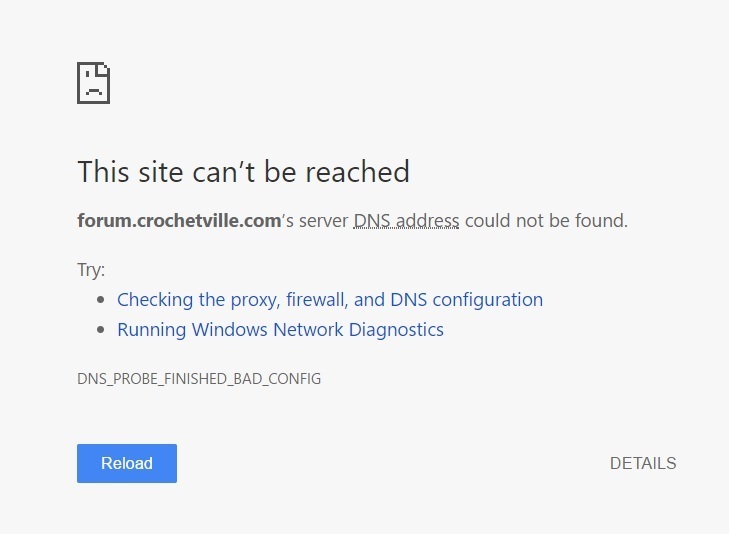 I keep getting the same message when I go directly to crochetville.com. I figured maybe it was just me--but...maybe not! I don't even remember now how I got to THIS place--but I put it on my computer screen, so I could access it! Who knows? Ah, good to know it's not only me. At least it's just a delay and not a complete shut-out. It seems to me that several years ago there was some trouble reaching the 'ville for a while, you had to use a proxy server. My understanding was (may be totally wrong or foggily remembered) some internet providers suddenly wouldn't recognize the 'ville server, and the proxy got around that problem; Donna/Amy had to get the 'ville platform provider to fix it on their end, which is why I brought it up. I just wanted to bump this topic; the problem went away after a recent downtime here (Late August/early September), but it is back again as of a couple of days ago (around Sept. 20). So far the site comes up eventually, but as I mentioned earlier I'm afraid it might be scaring new people away.